The program went very well, better than expected and a lot of experiences were exchanged. We would like to thank Dr. Stewart Wang [surgery.med.umich.edu], who led the training sessions. Dr. Wang's specialty is blunt force trauma an area of focused study. A major issue in burn care is controlling infection, which was another focus. From 23/04/2010 till 08/05/2010 a team or Russian medical doctors including Dr. Trusov, Dr. Starostin and Dr. Perskaya had a training in Burn care in the Burn unit of UM in Ann-Arbor. The purpose of the visit was a profession exchange in Burn care -- acute burn injury and its consequences. During two weeks Dr. Wang who is a head of the UM Burn Unit introduced us to the history of the Unit, conferences, wound care and all stages of burn care. Doctors and medical staff kindly provided us with a very helpful information including burn prevention, modern technologies in surgical and conservative burn treatment, rehabilitation after severe burns, new electronic technologies. We were lucky to meet a famous plastic surgeon who gave us a lot of useful information concerning reconstructive surgery in burns. It was a very good experience for me and gave me a lot in my professional and personal life. Everything was arranged in a good way. Starting from the day we arrived we kindly and warmly treated. My host family -- Kashehnko -- was great. They were doing their best for me to have a comfortable stay. They were really caring, attentive, patient and very tactful. Two weeks is long enough to get to know a person and I have to admit that they are really very kindhearted people. I am really grateful to them. I wanted to say thanks to all members of Russia with love and Russian Orthodox Church in Ann Arbor who took care of us and made our visit to US possible. We would go to visit different people almost everyday and we were surrounded by care and attention. Our trip to Henry Ford's museum, visiting an oratorio in the First Presbyterian Church, a barbecue in the Russian Orthodox Church -- will always remain in my memory. Russia with love kindly provided us with pocket money for 2 weeks and it made us feel very comfortably. The local transportation was very well arranged -- we were brought to the hospital and back and in many other places. Thanks to Dima Kashenko and Igor Obertas for their help. Our trip to the UM Burn Unit had an enormous importance for the three of us. Dr. Wang is a head of the Burn Unit and he was in charge of us during our stay. He is an outstanding doctor and has a beautiful personality. Even being very busy preparing his Unit for President Obama's visit to Ann Arbor (in case of emergency), he was doing his best to make our visit very informative, fruitful and comfortable. Thanks to him we could see all stages of burn care. We had meetings with everybody from the famous wound team and could see their work in real time. We were impressed by the system and their cooperation. Seeing new technologies in burn care was very important for doctors. But after all the most important thing was to see a totally different manner of treating patients -- a bedside manner -- which release a hospital related stress and even helps the doctor to feel more comfortable and ... human! I liked the attitude to relatives -- they can come almost any time the wish, they get information about their loved ones from doctors, nurses, social workers. For me personally the most significant thing to discover was the Burn prevention program. It includes many different projects -- nurses coming to schools to talk about burns with kids; firefighters coming to the Unit and to schools, making movies, bringing kids and their families to the Trauma Burn center and many others. I hope we can start a prevention program in Russia through the charity fund in the 9th hospital. We were also lucky to meet Dr. Feller who is a founder of the Trauma Burn center in UM. He is a man of 85, but still very active and leads a full life. He was the one to teach many burn surgeons throughout US. His pupils founded many Burn centers and became very famous. Dr. Feller still tries his best to help the prevention program work, he stays updated and is informed about all new technologies and events in Burn care. He generously gave us a lot of books and different tutorials concerning Burn care. Apart for the hospital everything was beautifully organized as well and prepared for us to feel comfortable and safe in US. I am very thankful to the people I stayed with. It was really lucky to stay in two different places in AA. I enjoyed staying with Linda Speck who is a member of Russia with love and is a very bright and kind-hearted person. Linda helped me a lot in transporation in AA and introduced me to many of her friend which was so nice of hers. I could visit the First Presbyterian Church with her and could meet many interesting people there. A Sunday concert givein Mendelson's "Elijah" was amazing and I enjoyed it a lot. The second family I stayed with were Bill and Betty Anderson, who are members of Russia with love as well. I really enjoyed staying with them -- not only Betty is a great hostess and a great cook, but both Bill and Betty are very active and it really impressed me -- golf, volleyball, woodcrafting, sewing -- and that's not it! I really felt home in their place. People from Russian Orthodox Church were very kind and we had a wonderful barbecue party though it was pouring deadly. A good thing about the whole trip was an agreement to go forward and bring doctors from UM Trauma Burn center to Moscow next year and show them the 9th hospital burn unit. We really hope that connections established during this trip will keep on developing and we'll be able to work together. The surgeon Dr. Oleg Starostin and the plastic surgeon Dr. Aleksey Trusov from the Burn Unit at Speranskyi Childrens Hospital in Moscow were together with Dr. Elena Persky invited to the Burn Unit at Michigan University Hospital in Ann Arbor. 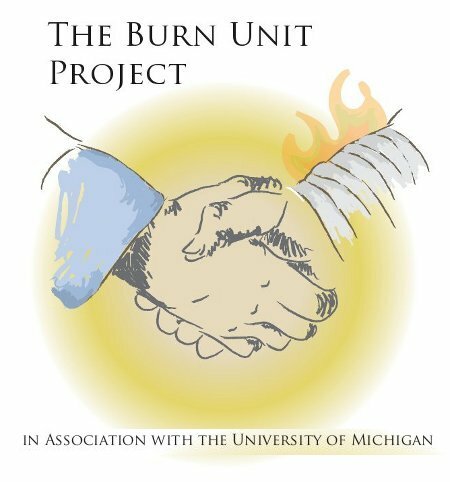 The idea and initiative for the Burn Unit exchange began many years ago when I in 1993 met Dr. John Howard Wilhelm (JHW an economist) from Ann Arbor in Moscow. JHW spend an academic year in the seventies in Moscow studying Russian language. He met, through his teacher, fr. Pavel Vishnevskyi, Moscow Patriarchate, with whom I have been working since 1992. The three of us knew that Russia in general needed support and education in many different ways. We also knew that we could not help Russia or Moscow. But we could begin with support to the people in the parish with basic needs. Michigan University - mainly based in Ann Arbor - had already began education courses at Moscow University and many professors visited us in the parish. JHW founded in 1998 the Russia With Love Committee (RWL) with the goal to support the people in the parish. I was invited to Ann Arbor first time in 2003 together with a friend and colleague from the Patriarchate. Margarita Neliubova was at that time supporting two sisters in taking care of a little girl with severe burns and we talked a lot about her healing. My friend professor of nursing Violet Barkauskas arranged a visit to several departments at the University Hospital - one of them the Burn Unit. Here we learned that this Burn Unit helped burned people all over the world through internet. Margarita told about the little girl in Moscow and the main doctor immediately invited Russian doctors to an exchange. A donation was given to RWL for an exchange. We were discussing the problems connected with project during the next four years. Where should we find the relevant doctors? Other problems was financial, accommodations, transport, language and when? The RWL Committee and St. Vladimir Russian Orthodox Church corporate and solved all the problems but the financial. IWC Charities gave a generous donation and paid one flight ticket for the Speransky doctors. Dr. Elena Persky was chosen from the parish to translate and her expenses were paid from other sources. Dr. Steward Wang, head of the Burn Unit at Michigan University Hospital invited the doctors and prepared a great program for them. We were ready. The three doctors flew to US April 23rd 2010 and arrived at the Burn Unit April 26th. Dr. Starostin and doctor Trusov was chocked from what they saw! They entered - for them - another and completely unknown world. Dr. Persky studied one summer in Italy and was less surprised. Everything was totally different from what they were used to from the Moscow hospital. Our training in the hospital was beautifully arranged. Even though our visit was not that long, we could see and feel all peculiarities of American Burn care. We met interesting people, world famous medical doctors. They kindly and patiently provided with all kinds of information. Dr. Wang is a very nice, intelligent and well-read person. I was happy to be able to meet such a person. His personality and his skill in all fields including management are beyond compare. We were able to see different units in of the hospital, but the most important thing for me was to see new technologies and new approach in reconstructive burn surgery. I would try my best to bring these technologies in Russia. I wanted to say thanks to all members of Russia with love and Russian Orthodox Church in Ann Arbor who took care of us and made our visit to US possible. We would go to visit different people almost everyday and we were surrounded by care and attention. Our trip to Henry Ford's museum, visiting an oratorio in the First Presbyterian Church, a barbecue in the Russian Orthodox Church -- will always remains in my memory. The local transportation was very well arranged -- we were brought to the hospital and back and in many other places. I thinks that beside a big benefit to my profession this trip has strongly effected my life in general and enabled me to see different relations and understand many things I could not understand in Russia. Who knows -- may be this trip can make me a little bit better. From 23/04/2010 till 08/05/2010 a team or Russian medical doctors including Dr. Trusov, Dr. Starostin and Dr. Perskaya had training in Burn care in the Burn unit of UM in Ann-Arbor. The purpose of the visit was a profession exchange in Burn care -- acute burn injury and its consequences. During two weeks Dr. Wang who is a head of the UM Burn Unit introduced us to the history of the Unit, conferences, wound care and all stages of burn care. Doctors and medical staff kindly provided us with very helpful information including burn prevention, modern technologies in surgical and conservative burn treatment, rehabilitation after severe burns, new electronically technologies. We were lucky to meet a famous plastic surgeon who gave us a lot of useful information concerning reconstructive surgery in burns. It was a very good experience for me and gave me a lot in my professional and personal life. Dr. Wang is the head of the Burn Unit and he was in charge of us during our stay. He is an outstanding doctor and has a beautiful personality. Even being very busy preparing his Unit for President Obama´s visit to Ann Arbor (in case of emergency), he was doing his best to make our visit very informative, fruitful and comfortable. Thanks to him we could see all stages of burn care. We had meetings with everybody from the famous wound team and could see their work in real time. We were impressed by the system and their cooperation. Seeing new technologies in burn care was very important for doctors. But after all the most important thing was to see a totally different manner of treating patients -- a bedside manner -- which release a hospital related stress and even helps the doctor to feel more comfortable and human! I liked the attitude to relatives -- they can come almost any time they wish, they get information about their loved ones from doctors, nurses, social workers. We were also lucky to meet Dr. Feller who is the founder of the Trauma Burn Center in UM. He is a man of 85, but still very active and leads a full life. He was the one to teach many burn surgeons throughout US. His pupils founded many Burn Centers and became very famous. Dr. Feller still tries his best to help the prevention program work; he stays updated and is informed about all new technologies and events in Burn care. He generously gave us a lot of books and different tutorials concerning Burn care. Apart for the hospital everything was beautifully organized as well and prepared for us to feel comfortable and safe in US. I am very thankful to the people I stayed with. It was really lucky to stay in two different places in AA. I enjoyed staying with Linda Speck who is a member of Russia with love and is a very bright and kind-hearted person. Linda helped me a lot in transporation in AA and introduced me to many of her friend which was so nice of hers. I could visit the First Presbyterian Church with her and could meet many interesting people there. A Sunday concert gave Mendelson's "Elijah" was amazing and I enjoyed it a lot. The second family I stayed with was Bill and Betty Anderson, who are members of Russia With Love as well. I really enjoyed staying with them -- not only Betty is a great hostess and a great cook, but both Bill and Betty are very active and it really impressed me -- golf, volleyball, wood crafting, sewing -- and that's not it! I really felt home in their place. I am really grateful to Russia With Love and its members, Connie Meyer, IWC, Misha Kazbekov and everybody who was working hard to make our trip. Dr. Lena Perskaya, Connie Meyer, Misha Kazbekov, and I met to discuss follow-ups for the recent visit to the U.S. by Drs. Starostin, Trusov, and Perskaya. We were excited by and grateful for the proposed visit in the spring of 2011 by Dr. Stewart Wang's team from The University of Michigan's Trauma Burn Center.